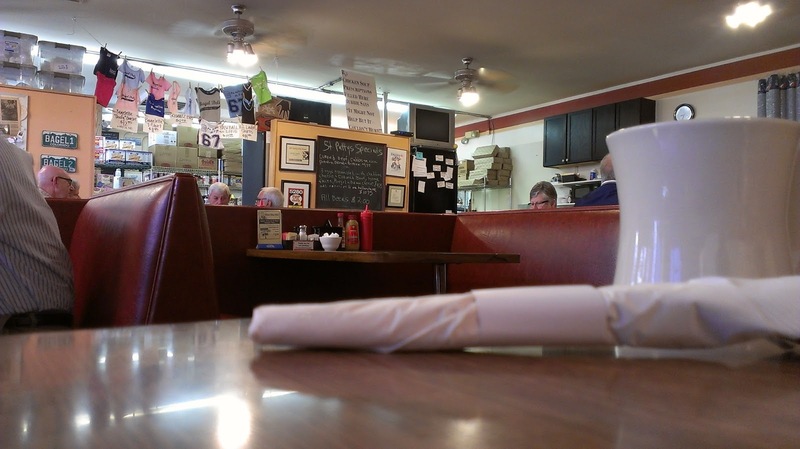 Denver on a Spit: A Denver Food Blog: Oy Vey! The Bagel Deli as Featured on the TV! Oy Vey! The Bagel Deli as Featured on the TV! A certain food celebrity with spiky hair and a sort of persona you might describe as a Rachel Ray mixed with a wannabe biker was recently in Denver to gush in cliches over more of our city's food. His arrival generated a little backlash--even a tinge of hatred--from more than one local media outlet. I'm not sure what makes him so polarizing, though I think watching too much Food Network these days would make anyone edgy. I personally have never been a fan (though I do secretly wish I came up with his tagline), but isn't it a good thing to get some national exposure for some of Denver's mom and pop joints? My answer to that question after eating at one of his stops on his last Denver tour is: maybe. It was a weekday and the Denver On a Spit family had the morning off so we packed ourselves in the car and made a trip down to The Bagel Deli. It wasn't until I was walking up to the restaurant itself that I found out they were featured on the Food Network, thanks to the hard-to-miss signs. We entered the half-deli, half-diner strip mall space and among the family pictures and other homey kitsch decor was a TV playing a loop of their 6.5 minutes of fame. Big signs advertising a TV show is understandable and is one thing, but playing that spiky blond blabbermouth on a continuous loop while good people are sitting down to break bread together is a special kind of torture. But still there was great service and even some refreshing East coast-style smack talking. When I wondered out loud to my server about ordering a simple bagel and lox, over the bagel and lox plate, he snarkily commented that the small sandwich would be a good choice if I was, "80 and having dinner at four in the afternoon." Well put. I respond well when my waiter challenges my manhood and overall eating stamina. And alternatively, for the record, I hate it when my waiter tries to get me to eat less-- what are you my doctor? 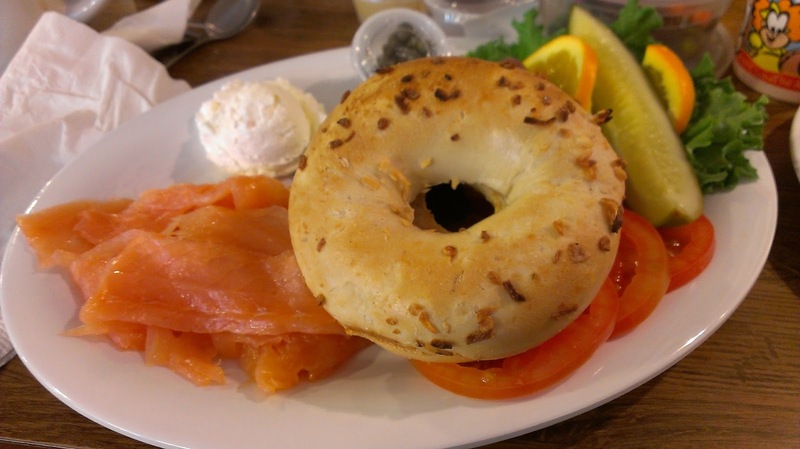 My lox and bagel platter was just what I was in the mood for. A hearty serving of smoked salmon and a scoop of cream cheese with all the fixings. 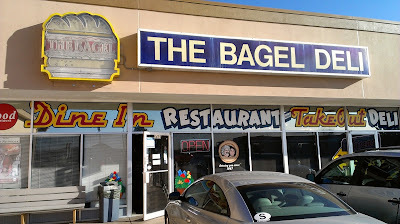 The bagel was decent and the meal was overall satisfying, and though not in any way large it would indeed probably be a tad too much for the average 4pm diner. If you do find your meal too much to handle, they do offer to-go boxes at The Bagel Deli; something we took advantage of for my wife's meal, a plateful of potato latkes. 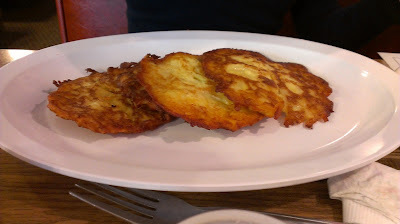 There didn't seem to be too many latkes, but they were a tad on the greasy side, so we boxed them up but I'm not sure we ever finished them. They were perfectly fine latkes, I just don't know if I've ever been in the mood for a full plate of latkes. I somehow managed to write a post about the Food Network show about greasy spoons, hole-in-the-walls and eating in cars without mentioning the host's name. If you are a an employee of Denver's alternative media, you might refer to him as, "he-who-must-not-be-named", and be proud of me. But come on. Is he really that bad? And if he is, doesn't he win--I mean have you seen his car and studded jewelry?-- he really is winning--for the attention he grabs?